This is a healthy, nourishing dish for that time of year when most people are coming down with a cold, and the rest are desperately trying to dodge germs to avoid being ill for a Christmas party, or Christmas day. The cold outside doesn’t help matters – it makes me crave a nice battered fish with some crispy chips. But that’s not going to help pump our bodies full of vitamins to stave off the illness. 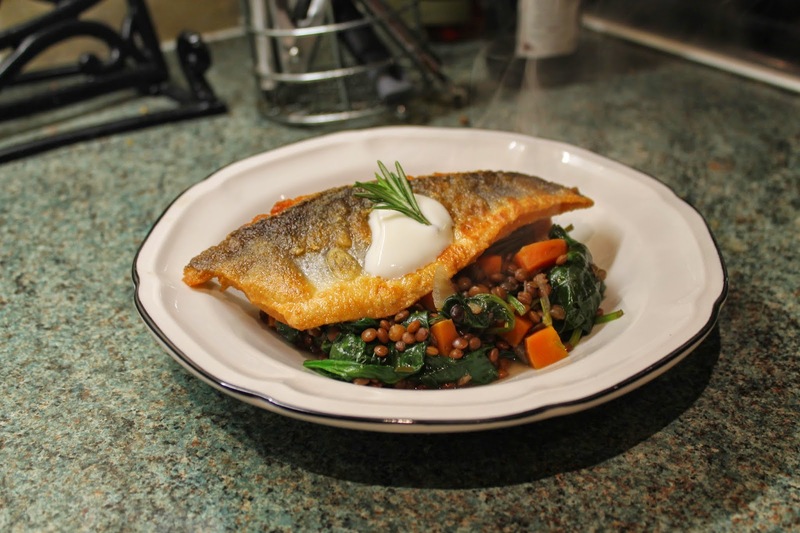 So, I’ve chosen a lovely fillet of sea bass (one of my favourite fish), simply pan fried and on a bed of tasty, nourishing lentils. Easy, quick and guaranteed to boost those white blood cells (I promise – it’s a scientific fact). This will serve 2 and take 30 minutes to make. 1. Dice the onion and carrot, then add to a large pan with half of the olive oil. Cook over a medium heat for 3 minutes, then add the lentils (including the liquid), chopped rosemary and vinegar. Put a lid on and simmer for 20 minutes. 2. Add the spinach to the lentils and allow to wilt. Turn the heat down to low and season. 3. Season the sea bass with salt and pepper. Pour the remaining oil into a frying pan and put on a medium-high heat. When the oil is sizzling, add the sea bass skin side down and cook for 4 minutes (depending on size). Flip over and cook for another 30 seconds. 4. To serve, ladle a portion of lentils into each bowl, then add the fish. Top with a small dollop of natural yoghurt. Certainly a dish to have for dinner tonight. Stumbling and day dreaming.